Calhoun County, Michigan, has received much deserved praise for the Historic Bridge Park that has provided a home for truss bridges relocated from elsewhere. But Clay County, Illinois, has something equally special. Sadly, it has gone unnoticed. 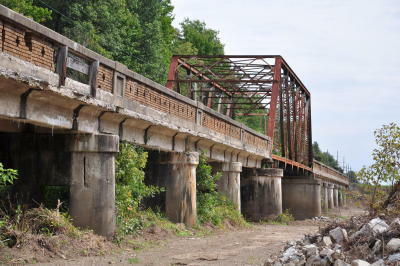 When US 50 was constructed in the early 1920s, the concrete highway included three through truss bridges and one long concrete girder bridge. Three of the four bridges were built with unusual brick parapets. 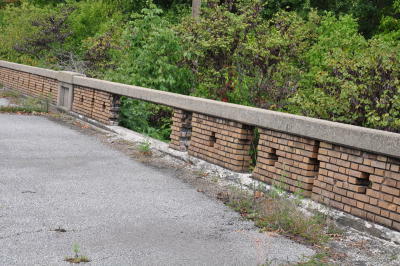 The highway was bypassed decades ago by a new alignment, but everything from the vintage highway remains intact: the bridges, the concrete pavement, and the brickwork. Of course, the lack of maintenance has caused the structures to deteriorate, especially the intricate brickwork. While the bridges are barricaded, the connecting stretches of concrete highway are still open to traffic (for landowner access), but see virtually no use, except perhaps from ATV riders. The pavement is rough, but this 2.5 mile stretch of vintage highway has potential as a pedestrian/bicycle trail. With some repairs, brush clearing, and signage, this could be a wonderful park that would cost relatively little. Unfortunately, the replacement bridges on US 50 are also deteriorating, and IDOT intends to replace them in the coming years. This means that the historic bridges, which sit side-by-side to the replacement bridges, are likely in jeopardy because of their proximity to the construction area. 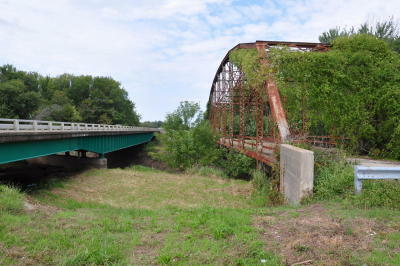 Local and state officials probably consider these orphaned bridges to be a liability, but with the right marketing, they could be transformed into an asset instead. 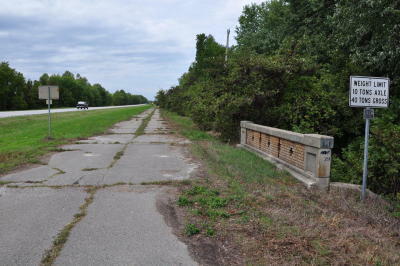 The concrete girder bridge has been determined eligible for the National Register of Historic Places, but I feel the entire collection of bridges and pavement should be evaluated as a potential historic district. 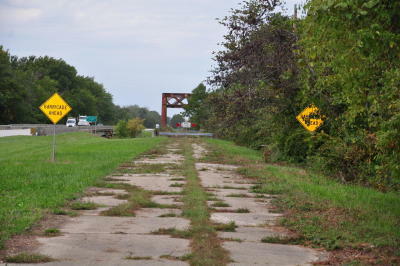 This could become a recognized historic site and a recreation area, all with a budget that would be far lower than what other counties and towns are spending to build brand-new walking and bicycle trails. I drove out to see these a few years ago. There have been rumors all along that these were slated for demolition. There have also been rumors forever that officials want a 4-lane US 50 here and that would take these bridges out.